A fun board game about asset management may sound pretty much like a contradiction. Synergy however, is a board game where teams spend Sellafield-minted money, worth £millions, on a range of facilities and infrastructure for the Sellafield nuclear site in Cumbria. 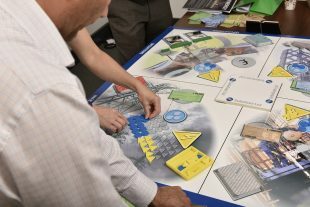 Synergy was designed for Sellafield by Vulcain Engineering Ltd, supported by its strategic partner Oxand, and is based on one of their existing business board games. Synergy is used in workshops that aim to develop asset management understanding. 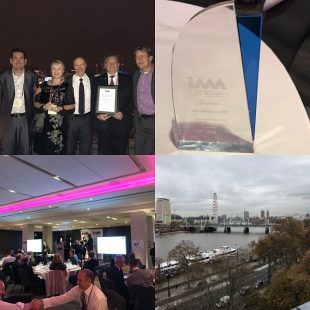 The NDA has supported the development of the game where Sellafield Ltd was not only the customer but was actively involved in the design and development process. Vulcain Engineering Principal Consultant, Simon Spencer, an asset management specialist who previously worked at Sellafield, led the project. The question is how do you make the fundamentals of asset management interesting and enjoyable to learn? In a PowerPoint presentation, on average you will only take in about 6% of the information on the screen; in a face-to-face conversation, it’s about 20%, but with a simulation or an activity based tool like this, it’s will be up to 75%. 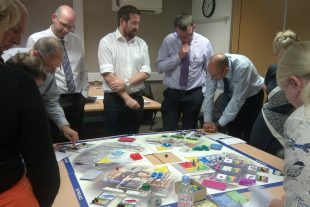 Oxand’s existing AM board game wasn’t created for the nuclear industry or for Sellafield, so we adapted it to better reflect the operational challenges and decision-making processes of a live site. It is about ensuring that an understanding of the reality of managing assets is embedded across all levels of the workforce. Interestingly, there’s no winner in Synergy, but there is the satisfaction of a job well done.